CORFU, Greece — A cargo ship rescued scores of Afghan migrants in heavy seas off the Greek island of Corfu Sunday following a night of drama, but survivors said 21 more were missing after falling overboard. Rescue services were alerted during the night after the 35-metre (114-foot) Hasan Reis vessel packed with more than 200 migrants, including women and children, reported it was taking on water, said the merchant marine ministry in a statement. The worn trawler, which was bound for Italy, sunk after being cut in half following an engine breakdown, port police said. A Dutch cargo ship, the Momentum, was first to reach the stricken vessel around 30 nautical miles off the coast of Corfu, and took 230 migrants on board. But some survivors said 21 people were missing after falling into the sea when the Momentum began taking on migrants amid strong winds. "I'm afraid they've drowned," said one survivor as he set foot on Corfu following his rescue. The migrants were mostly men but included 11 children and five women. Police identified and detained two suspected Turkish smugglers. Fifteen were hospitalised for minor injuries. "They were shocked, terrified," said local health official Kyriakos Katsouris. A police source said authorities were looking into people trafficking from Greece's southern Peloponnesian coast. 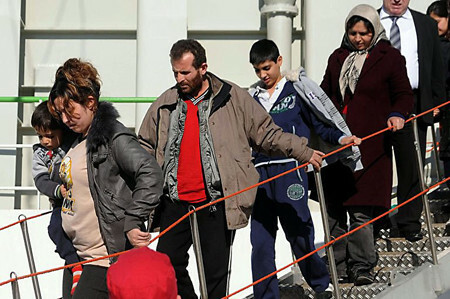 The migrants, many of whom spoke Greek, said they had paid 3,000 euros (4,015 dollars) to be transported to Italy. Located at the edge of the European Union and lacking a coherent immigration policy for years, Greece has become the main entry-point for illegal migration in Europe. Tens of thousands of migrants cross over into Greece from neighbouring Turkey each year, with traffickers inventing new itineraries and modes of transport. After the port of Patras, Greece's main point of passage to Italy, and Igoumenitsa in the north, Corfu attracts hundreds of migrants. Worsening security and enduring conservative Islamic customs prevented almost five million Afghan children from going to school in 2010, a government official said on Saturday.